This is a 3-4 day track that is located near Makarora at the head of Lake Wanaka. Being a loop it can be tramped in either direction, but most parties start at the Young River valley and go over Gillespie Pass into the Siberia valley and then return to Makarora via the Wilkin valley. A new bridge at Blue Pools (add 1.5 hours) allows you an alternative to cross the river. Jetboats operate on the Wilkin and Makarora and can be hired for those not wanting to walk or unable to cross due to high water levels, and scenic flights also operate from Makarora to an airstrip in the Siberia valley located near the Siberia hut. 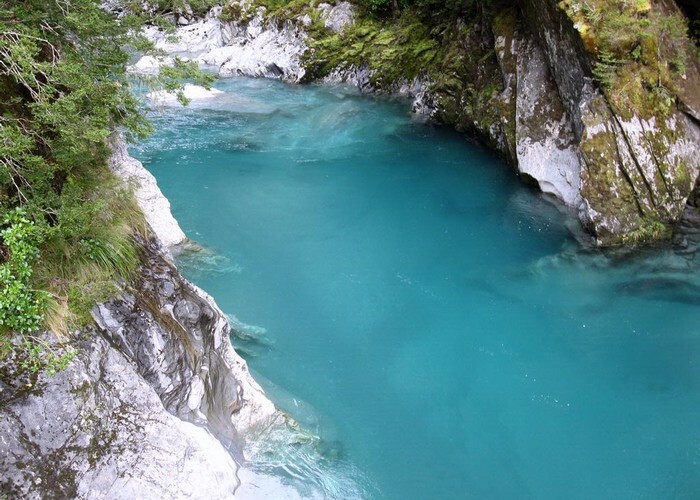 DoC has now built (2009) a 7km link track from the bridged Blue Pools to join the Young river if the Makarora is unfordable. Highlight of the circuit is Crucible Lake reached via daytrip from Siberia Hut, or a very long day from Young Hut. Walking on Air • By apurdam. Licence: cc by. Upon reaching the Young River after fording/jetboating the Makarora or walking down from the Blue Pools, the track heads up valley on the Youngs True Left through forest and river flats. The confluence with the Young North branch is met after about 3-4 hours and a swingbridge is crossed. Theres a DoC campsite here with shelter and pit toilet. The track continues up the South branch, a rocky slip is crossed and the track climbs up past a gorge to eventually reach the new Young Hut after a further 2 hours (relocated at F38 974 628, marked correctly on BZ12). The Blue Pools • By Yarmoss. Licence: C.
The track continues climbing and clears the bush and the head of the Young valley becomes visible. A footbridge is crossed and the last part of the valley is climbed on the True Right. The track vears sharply to the West and climbs steeply up a grassspur for about 500 verticle metres. The Gillespie Pass is at the top and offers great views. A further climb to the South takes you to the highest point on the track, then there is a long decent down, first into bush and grassy flats of the Gillespie valley, then through bush to the Siberia valley, the last part zigzagging down to the valley floor. Its about a furthur hours easy walk down the Siberia valley flats to Siberia hut. 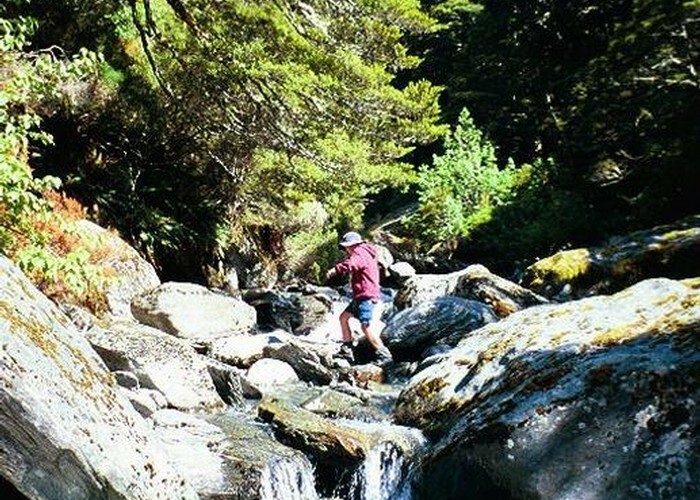 Those with gass still left in the tank and daylight hours to use may wish to head imediately to Crucible Lake by fording the Gillespie Stream then dropping their packs off before crossing the Siberia stream. Cruicible Lake can be reached after about 2 hours from first ariving in the Siberia, and thus saving a daytrip from Siberia hut. Young hut to Siberia hut about 7 hours. Young hut to Siberia hut via Crucible Lake about 10+ hours depending on time spent at Crucible. The route up to Crucible Lake climbs almost vertically beside the Crucible stream to negoatiate a waterfall then continues steadily up valley. The stream has to be forded part way up which can be tricky after rain. The bushline is then reached and a clear view of the head of the valley and the moraine wall is obtained. A further 20 minutes scramble gets you up the valley and ontop of the moraine where Crucible Lake can be seen. Head round to the Western end of the moraine to truely appreciate how Crucible Lake gets its name. Crucible Lake from Siberia hut allow 5-6 hours return. From the 20 bunk Siberia Hut, the track heads South and leaves the Siberia flats. It climbs up above a massive gorge before descending down a series of zigzags. The confluence of the Siberia stream and Wilkin river is reached after about 2 hours at Kerin Forks. Jetboats can be caught from here and can take you back to Makarora for about $75pp. Parties continuing up the Wilkin need to ford here (impassible if in flood) though the jetboats usually ferry trampers across for about $15pp. The track continues South down the true left of the Wilkin through river flats, farmland and bush, though parties may find travel quicker by fording the Wilkin and heading down the True Right. 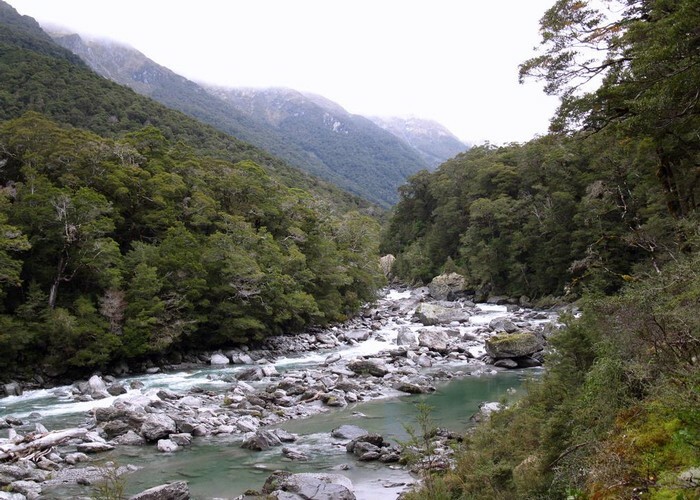 Upon reaching the Wilkin/Makarora confluence the track basically ends but parties have to find a place to cross the Makarora and return to the township. Again, the jetboat may be the only way across if the river is up. Siberia hut to Makarora 7-9 hours on foot or 2.5 hours via jetboat from Kerin Forks. The Young River • By Yarmoss. Added 6 September 2009 by YarmossYarmoss. 6 revisions, most recently 2 February 2010 by JeanieJeanie. 1,176 views in the past year (98 per month).